Cyclone Debbie made landfall in northeast Australia, with lashing rain and howling winds battering the area as local towns went into lockdown. 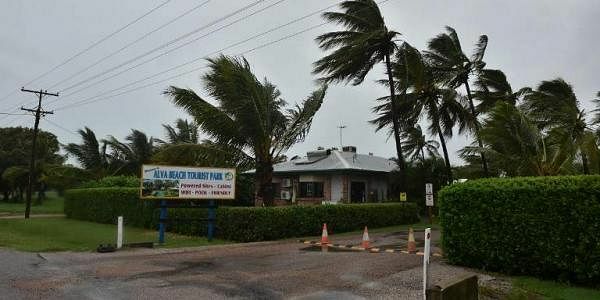 AYR: A "monster" cyclone made landfall in northeast Australia Tuesday, cutting power and uprooting trees as coastal towns went into lockdown in the face of lashing rain and howling winds. Great Barrier Reef islands popular with foreign tourists were pummeled by the category four storm which hit the Queensland state coast with destructive wind gusts of up to 270 kph (167 miles) near its wide core. There were fears the tempest's arrival would coincide with early morning high tides, causing severe flooding, but its progress slowed before it crossed the coastline between the towns of Bowen and Airlie Beach. The full force of the cyclone was already being felt in popular tourist destinations. "It felt like we were underneath a freight train for most of the night, strong base rumbles as the... wind rattled past and made the buildings shake," Cameron Berkman, who is holidaying on Hayman Island, told the Australian Broadcasting Corporation. Queensland politician Mark Ryan said it was also chaotic at Airlie Beach, the mainland holiday gateway to the Whitsundays. "Trees down in Airlie Beach and reports of windows shattering and some roofs starting to cave in," he tweeted. The Bureau of Meteorology, which forecast up to 500 millimetres (50 cm) of rain, said people should stay calm and not be complacent as the eye of the storm passes. "Do not venture outside if you find yourself in the eye of the cyclone -- very destructive winds from a different direction could resume at any time," it said. "People in the path of the very dangerous cyclone should stay calm and remain in a secure shelter." Queensland Premier Annastacia Palaszczuk, who warned the storm was shaping up as a "monster" and would last for hours, said more than 30,000 homes were already without power. Queensland Police Commissioner Ian Stewart said Debbie's slow pace was having "a battering ram effect". "These winds are going to keep pounding, pounding, pounding," he said. "I suspect before the day is out, we will see a lot of structural damage in the cyclone's path." Residents across the area, who have sandbagged and boarded up homes, have been told to prepare for the worst weather to pummel the state since Cyclone Yasi in 2011, which ripped houses from their foundations and devastated crops. The federal government is on standby to provide immediate assistance in the aftermath, with a disaster relief ship en route from Sydney and navy helicopters and planes on standby. Some 3,500 people were evacuated between the towns of Home Hill and Proserpine, around 100 kilometres (62 miles) south of Townsville, a tourist hotspot and access to the Great Barrier Reef. Another 2,000 people in the coastal area of Bowen, which was predicted to bear the brunt of the impact, have also moved, officials said, with cyclone shelters available for those with nowhere else to go. Up to 25,000 more in low-lying parts of Mackay have headed to higher ground. In the small town of Ayr, the main shopping street was deserted with buildings boarded up. Local Eddie Woods said he was prepared but undeterred, having lost count of the number of cyclones he has lived through since the 1940s, citing Yasi as one of the worst. "Yasi had a big tail on it, and they never told us anything about that and it blew like hell," he told AFP as he sheltered in a refuge with dozens of others. For farmer Anthony Quirk, his main concern was his 150 hectares of mung beans. "If it comes through here it will be over. It will lay flat on the ground, we won't be harvesting, we will have no crops left," he said. "It means we start from scratch again. All the money down the drain. That is not good."